4.3 out of 5 based on 129 bloggers and 7 commenters. 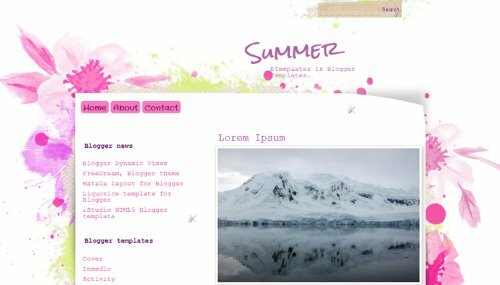 Summer is a free blogger template with 2 columns, left sidebar, an exclusive design for Blogger, footer columns, cute design, girly looking, floral motifs and vectorial elements. may i have the code of this template?? Please give me as fast as u can.thank you. Really , The Best Template I Had Ever Seen .. I am just starting up my blog and I know I will get followers with this beautiful template. Thank you so much for sharing this. Love the template. Uploaded it. Everytime I open my blog, I get a virus warning. Thanks for the headache. SDM LANGUAGE SCHOOL, 1994 yılından bu yana İngilizce, Almanca, Fransızca, İspanyolca, İtalyanca, Rusça, Yunanca ve Yabancılar için Türkçe olmak üzere çeşitli dillerde eğitim vermekte olan bir dil okuludur. Birebir Eğitimler ve Kurumsal Eğitimler olmak üzere öğrenci adaylarımıza eğitim çözümleri sunmaktayız.